It happened that Samson fell in love with a woman called Delilah. So Delilah bugged Samson day and night, asking him question on what makes him so strong. The Philistine Lords brought seven bowstrings to Delilah. Delilah tied Samson with the seven bowstrings. Then she shouted, “Samson, the Philistines are here to attack you,” Samson broke the seven bowstrings as a strand of yarn that touches fire. So Delilah bound Samson with new ropes and shouted, “Samson, the Philistines are here to attack you.” Samson broke the ropes off his arms like a thread. Delilah was not satisfied that Samson had not yet gives her the answer so she began to bug Samson. So Delilah weaved Samson’s hair tightly into a loom. Then she shouted, “Samson, the Philistines are here to kill you.” Samson awoke and pulled his hair away from the loom. Delilah lulled a lullaby and made Samson fell asleep on her legs. Samson woke up but the strength of God was not with him anymore. The Philistines bound Samson, and took out his eyes. They made Samson grind the grains. Samson’s hair began to grow again. One day, the Philistines held a feast to celebrate the Philistine God Dagon. They sent for Samson to be brought out to entertain them. Samson was standing near a column. There was a young man nearby and Samson said to him, “Help me to feel the two pillars of the temple.” The young men helped Samson. Samson took hold of the two large pillars that supported the temple, and pushed it down. The whole temple collapsed and everyone in it died. 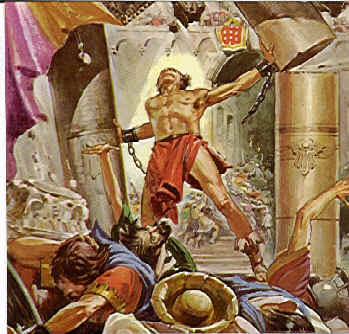 Samson killed more people through the collapse of the temple than during his life time. Samson was buried in the tomb of his father.